Holdbacks made of resin; hand painted in the USA in Antique Gold or Italian Walnut finish. Each is 6"Dia. x 4.5"D.
EXCLUSIVELY AT NEIMAN MARCUS Handcrafted, hand-painted antique gold finish with tole double scroll design and round bar border decorative single panel fireplace screen. Traditional design. 39.5"W x 8.5"D x 31"T. Imported. Boxed weight, approximately 18 lbs. EXCLUSIVELY AT NEIMAN MARCUS Fireplace screen handcrafted of iron. Hand-painted Italian-gold finish. For decorative use or use with gas logs only. 48.75"W x 9"D x 32"T. Imported. Boxed weight, approximately 31 lbs. Handcrafted fireplace screen. Cherry blossom accents. Iron and tole with mesh backing. Hand-painted finish. 39.5"W x 7"D x 30.25"T. Imported. Handcrafted fireplace screen. Cherry blossom accents. Iron and tole with mesh backing. Hand-painted finish. 39.5"W x 7"D x 30.25"T. Imported. Boxed weight, approximately 18 lbs. EXCLUSIVELY AT NEIMAN MARCUS Handcrafted fireplace screen made of iron and tole. 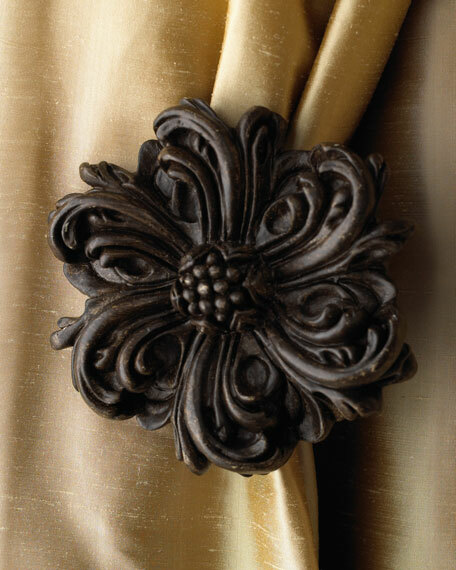 Delicate design with scrolls and leaves in hand-painted Italian gold finish. 38.8"W x 8.5"D x 31.8"T. Imported. Boxed weight, approximately 15 lbs.